The RPM System just got better! As I mentioned in some of my recent posts, I recently (5/18) started on the RPM System, a new fitness regimen that you can do with only an exercise ball and an exercise band, and I love it. I recently passed my 6-week progress point, and I plan to post the results from that re-assessment this week. 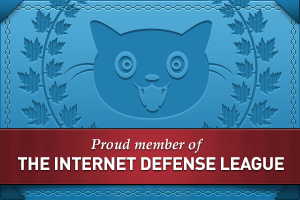 The cost has been reduced to $9.95/month, which makes it affordable for just about anybody. It’s now much, much lower than a gym membership, and since you can do it at home, you’ll be saving time and money. Those using the system will have the opportunity to sign up their family members at $7.95/month, with a special code, which will make it easier and even more affordable to stay fit. You’ll be able to work out together and encourage each other. It’s much easier now to get the equipment you need for the program. 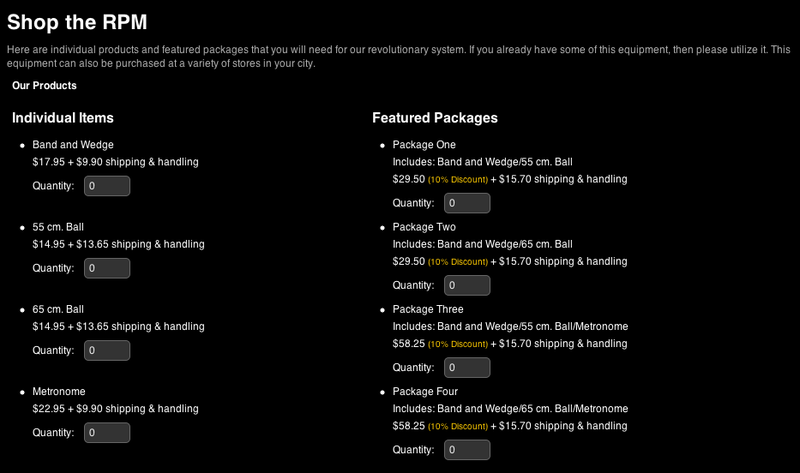 There’s a new Equipment tab on the site menu, where you can purchase the exercise band and the ball, plus the door wedge and the metronome, which are the two additional items I didn’t know about when I started the workouts. Fortunately, you can get all of this as a bundle from the Equipment page, so you’ll be able to get right to the workouts without missing a beat. As a matter of fact, the door wedge is included with every exercise band, right off the bat. And you no longer need to get a metronome, unless you want to. All of the exercises have been changed to the same beat. If you want to try different beats as you advance through the workouts, you can, by using a metronome, but it’s no longer a must-have piece of equipment. I took a few screenshots of their website, to give you a sense of the changes. Here’s the page where they describe why you should use the program. The new price is clearly posted there. And here’s the Equipment page. As you can see, things are nicely bundled and the prices are quite affordable. One of the things I like about this fitness program is the fact they donate to charities. It’s nice when a company decides to do that, especially in these troubled economic times. The founders donate 10% of the corporate profits to the Susan G. Komen Breast Cancer foundation. 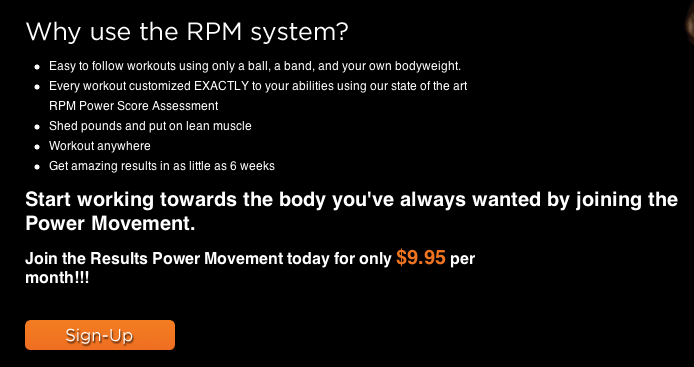 If you’d like to try the RPM System, you can get a 2-week free trial through this referral code: 553677456. The normal free trial is 1 week, but this way, you get to really use the system enough to see its true benefits to your body. I have, and I plan to keep using it for a long time. As I mentioned in my very first post about the RPM System, I am using the system for free. When the founders asked me to review it, that was one of the benefits I got in exchange for putting in the time and effort of using the system enough to be able to speak cogently about it. But I wouldn’t have stuck with it for 6 long weeks if I didn’t love it, and I do. When I say you should give it a try if you’re not already exercising, I really mean it! You will see results!